Seeking refuge from post-election despair, GetIntoThis’ Paul Riley sought escapism and solace in Scottish folk brilliance. It is more than a little odd to be taking in an early-evening vista of X In The City, The Krazyhouse and O’Neill’s, from the comfort of a winged-back leather armchair. The Epstein, with its polished parquet flooring and grandiose interior, is delightfully incongruous for this reason. A diamond in the rough, this place has been lovingly restored and is a breathtaking experience made all the more ethereal when you consider the view that presents itself from the bar windows. At the beginning of the evening, all was fairly well-ordered as we looked down onto the street; no sign that by closing time it will inevitably have descended into something straight out of Apocalypse Now. As The Hanover Hotel geared itself up for another Saturday night of Lord of the Flies meets The Warriors, folk fans old and young moved from Brian’s Bar into the theatre itself, for an evening featuring one of the finest contemporary Scottish bands. 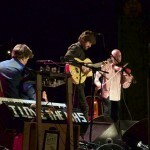 Lau are accordionist Martin Green, guitarist Kris Drever and violinist Aidan O’Rourke. 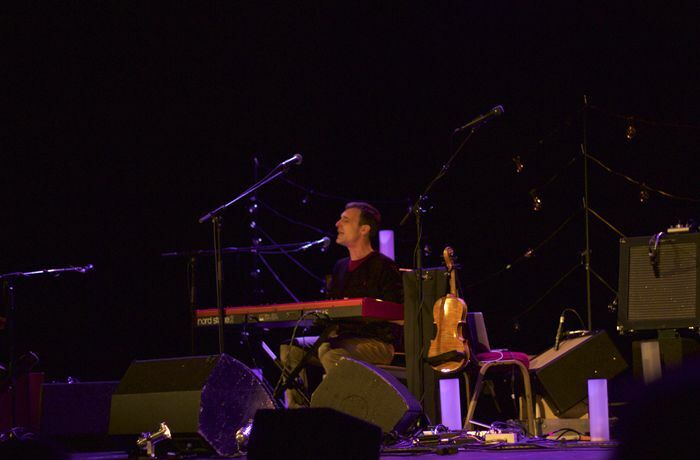 They won Best Band in the BBC2 Folk Awards 2008, ’09 and ’10 and were nominated again in 2014. Those achievements cannot be put down to lack of competition. Instead, the success is due to their technical ability, emotional impact and the way in which they bounce off each other onstage. Highly personable whether playing or just joking with each other, a Lau show is like being a fly on the wall watching three best friends have a laugh and play some incredible music in the meantime. How many bands can you think of who play cutlery? No, not the spoons in this case, but a homemade contraption that ended in a sea of cables and pedals. Unusual to say the least, but then they all have a refreshingly innovative approach to their instruments. 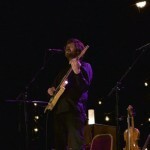 O’Rourke alternated between playing the fiddle like a guitar, in a folky style with a sawing bow action, and more traditionally in a classical style. 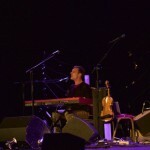 Green provided samples, piano and an accordion which sometimes doubled as a bass drum. 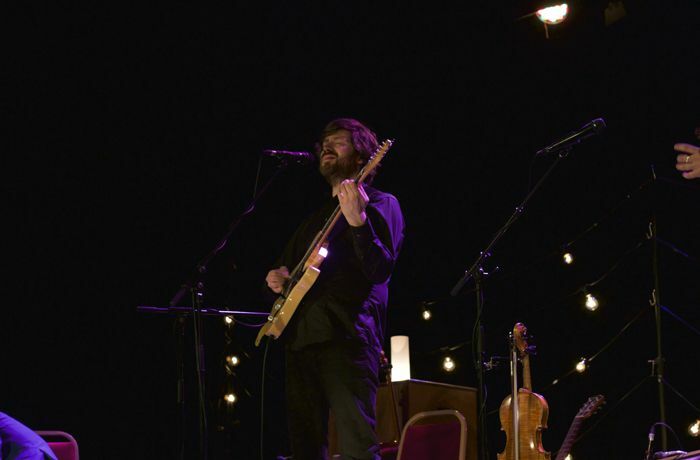 To the left and right of the stage, they parried the complex melodies between them while, centre stage, Drever’s sensitive and accomplished guitar provided an anchor to the songs. All three were equally adept at taking the lead; they played and sang together with an intuition borne of long shared experience. 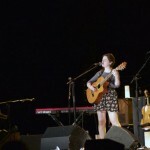 The songs were great examples of storytelling combined with folk influences that grew increasingly Northerly as the show progressed. 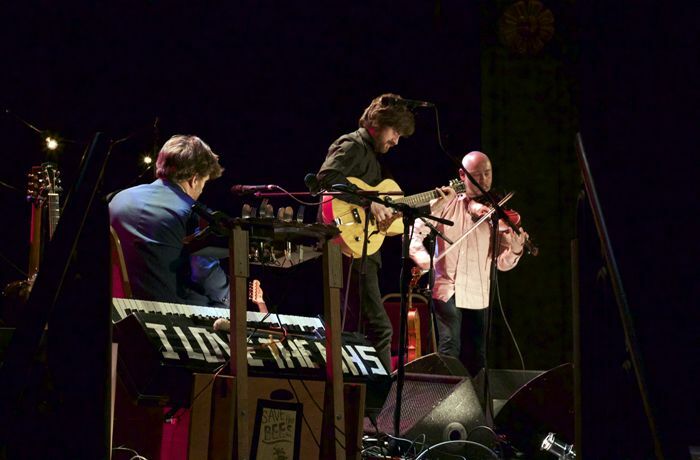 With a few tongue-in-cheek references to our new government and a piano with ‘I LOVE THE NHS’ emblazoned across it, they struck a chord with the Liverpool audience that was a perfect example of folk as a culturally and socially aware art form. By the end of the evening it is fair to state that a number of the audience may have been inspired to take holidays north of the border. In light of the recent election, Lau’s cheerfully defiant Scottish humor and their clear distaste for everything Conservative, GIT may not have been alone in wishing for a more permanent arrangement. Then again, as Drever noted at one point, perhaps Orkney really isn’t far enough. 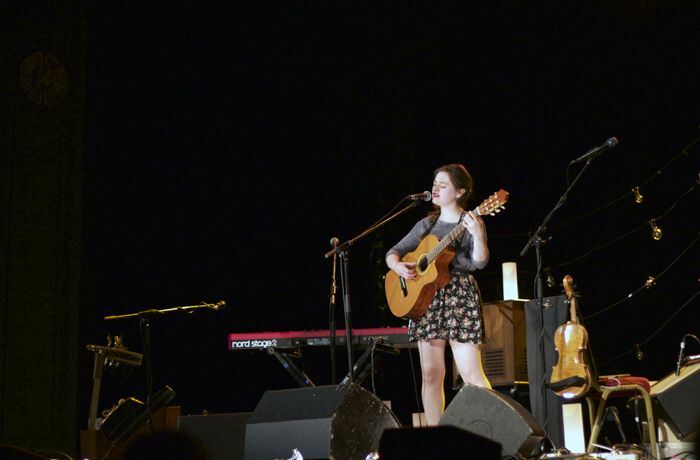 Support came in the delightful form of fellow Scot Siobhan Wilson, whose crystal clear and fragile vocal delivery brought to mind artists such as Cara Dillon. Spellbinding and compelling in equal measure.